Gingerbread men are soft cookies, flavoured with ginger, cloves, nutmeg or cinnamon and sweetened with honey, sugar or molasses. The origin of gingerbread is a bit complicated as it is know through Europe but today lets talk about its connection with Greece. Ginger (Zingiber officinale), was known in Greece from antiquity. In fact it is mentioned by Dioscourides (40 – 90 AD) for its medicinal properties. In ancient Greece, ginger was known as zingiberis (ζιγγίβερη ή ζιγγίβερις – ancient Greek ζιγγίβερις), from Prakrit (Middle Indic) singabera and arrived to Greece through the spice route trade. 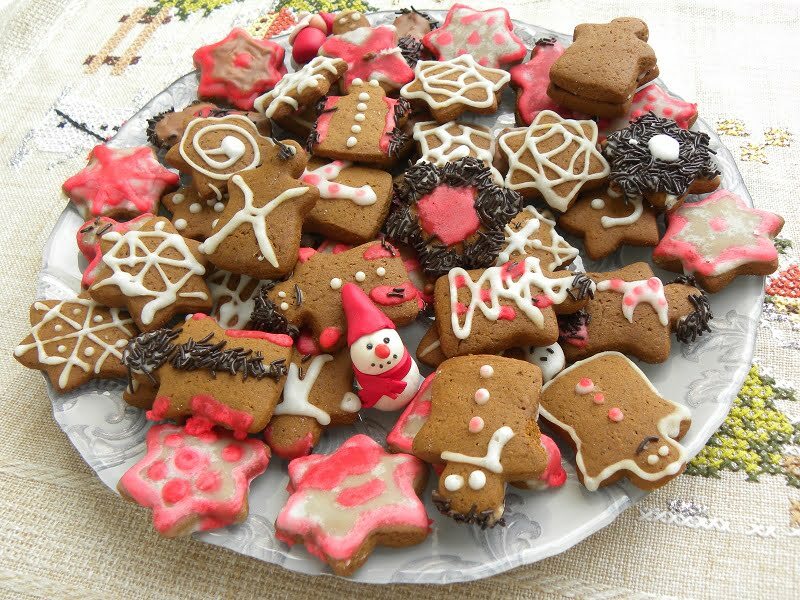 Gingerbread were brought to Europe in 992 AD by the Armenian monk Gregory, (also called Gregory Makar and Grégoire de Nicopolis), who lived in Ancient Nicopolis. At the time, Nicopolis was the capital city of the Roman Province of Epirus (which was near Preveza, in western Greece). Gregory left Nicopolis to live in Bondaroy (north-central France), near the town of Pithiviers, in North-Central France. He stayed there for seven years and taught gingerbread baking pain d’épices (literally “spice bread”) to French Christians. It was then spread to many other parts of Europe. Eventually it took the form of the cookie we know today, retaining its old name. The recipe is based on my Spiced Carob Cookies, with a few minor changes. I love carob syrup, which adds an amazing chocolaty taste. In this recipe I use dry ginger and cane sugar and I add no cocoa or chocolate. I added some of the Gourmet Salt I made with Peppermint. You can just add plain coarse sea salt if you like, but although the taste of peppermint is very subtle, it adds to the overall flavour. The gingerbread recipe is perfect to make with kids, and to eat with the rest of the family at Christmas or any time you fancy. Their taste is amazing. They are so addictive you just can’t eat just one. The decoration takes a lot of time. As it was our very first time attempt decorating them, it took about an hour for my daughter and I to finish them. If you like, you can decorate them with Royal Icing. However, I’ve stopped using it because of the raw egg. Instead, I made a lemon glaze, which matched perfectly with the other flavours. If you like the taste of lemon, as much as I do, all you need is fresh lemon juice and icing sugar. You can add flavour if you like and if you want coloured icing, just add a drop of food colouring. If you don’t like lemon, you can add just a tablespoon of lemon juice and add other liquid of your choice. Be careful what to add, as it may colour the icing. Milk, rose water or blossom water would be my other choices. Although I have a decoration pen and some writing icing, I forgot to bring them along from Asini, so I had to improvise. I bought a syringe from a drug store, which I used (without the needle) to make the decoration on top. Another way to decorate them, if you do not have proper equipment is to use a sandwich bag and make a very small hole at the corner. These gingerbread cookies are made with carob syrup instead of molasses and perfect to add to your Christmas cookies recipes. Combine together and whisk the first seven ingredients. In a large bowl, using a hand-held electric mixer, beat the butter and sugar, at high speed, until well-combined, for about 1 minute. Add the carob syrup and mix. Add the flour mixture gradually, scraping well after each addition and continue and mix until you have a stiff dough that does not stick on the hands. Divide the dough into two disks and put it between two sheets of cling film, on a tray or cutting board. Using a small dowel, to flatten the discs to about 1 cm thick. Refrigerate until chilled, for about 1 hour to firm up. Take out of the fridge the first cutting board and cut out cookies with the desired cutter. (I used the 5 cm cutter). Gather all the leftover pieces, form them into a disc, place it again between two pieces of cling film and refrigerate. Continue with the second tray. Place the cut cookies on a large baking tray lined with parchment paper. (I used the one which fits in my oven, one next to the other. They do not need to be spaced apart as they do not spread). Refrigerate for half an hour. Continue with the leftovers, which will make a third tray. Preheat the oven to 350 o C / 350o F.
Place the baking tin in the centre of the oven and bake for ten minutes. Set aside to cool. Sift the icing sugar and put it in a bowl together with vanillin. Add lemon juice gradually and mix to make a thick paste. If it is too runny, add more sugar. If it is too thick add more lemon juice or water. On a sandwich bag make a very small hole with a toothpick or use a syringe (without the needle) and pipe out the design you like. Set aside for the frosting to dry and then store in an airtight container. The preparation time is 10 minutes to make the dough and the rest of the time is cutting them. The cooking time is ten minutes for each batch (I made three batches). The decoration time is about 1 hour, for two persons working together. The cutter I used was 5 cm long.